Jonathan was born in Cape Town, South Africa of immigrant British parents. His formal art studies started with one year at the Cape Technikon prior to two years military conscription into the Namibian/ Angolan war. He then went on to study further at the Ruth Prowse School of Art in Woodstock Cape Town 1983 - 1986, majoring in printmaking and drawing. Further study and practice of printmaking was done at Peacock Printmakers in Aberdeen, Scotland 1986 - 1988 then in 2006 a Diploma in Lithography,distinction, at Michealis School of Art ,UCT. In 1989 he established an independent printmaking studio, Hard Ground Printmakers till 2007 before moving to the United Kingdom..
Jonathan is currently working in London as an artist / printmaker. He continues indipendently publishing fine art prints with artists in both London and Cape Town. 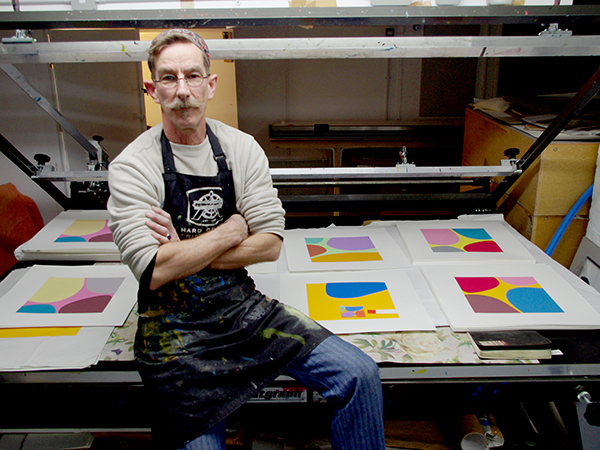 I am an artist/printmaker as well as a publisher of prints. Since 1987 I have published and collaborated with numerous artists, both individually and through producing collaborative portfolios, from around the world. My forte as a multi-disciplined artist/printmaker is in engaging the diversity of techniques printmaking has to offer ranging from etching, mezzotint, silkscreen, linocut, collagraph to silkscreen as well as digital prints. Jonathan Comerford is the recipient of the Volkskas Atelier Award, 1995, and spent 6 months at the Cite des Artes, Paris, France. 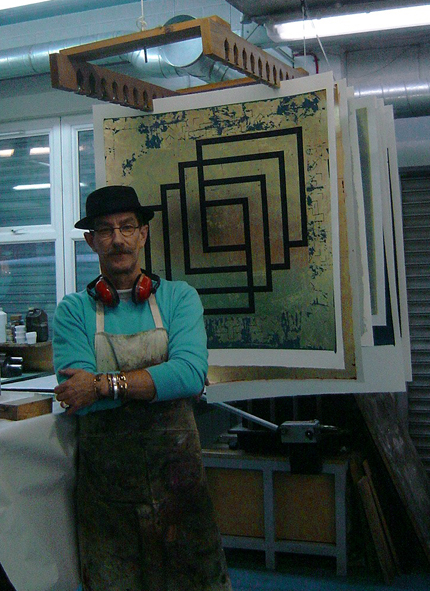 He has taken part in numerous Print Bienniales and exchange programmes and has been a resident artist at the Grafische Werkstatt im Traklhaus, Salzburg, Austria. His work is represented in collections such as the National Gallery, the Sanlam Collection and the Sasol Museum. 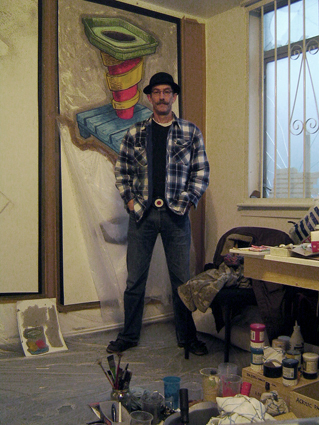 Jonathan in Studio 75, London, with his mixed media work.